"No real gardener," goes the old saw, "ever buys hostas." As the shade-loving perennials multiply quickly and are easily divided into new plants, landscaping with hostas often links those with too many hostas to those wanting more. According to online landscaping resource Northscaping, in recent years, the growing fondness for home gardening has stimulated a multitude of hosta choices with the development of new cultivars: golden, blue-green, heavy-flowering, fragrant. Use the new hostas along with traditional favorites to beautify your shady yard and enhance your landscape. 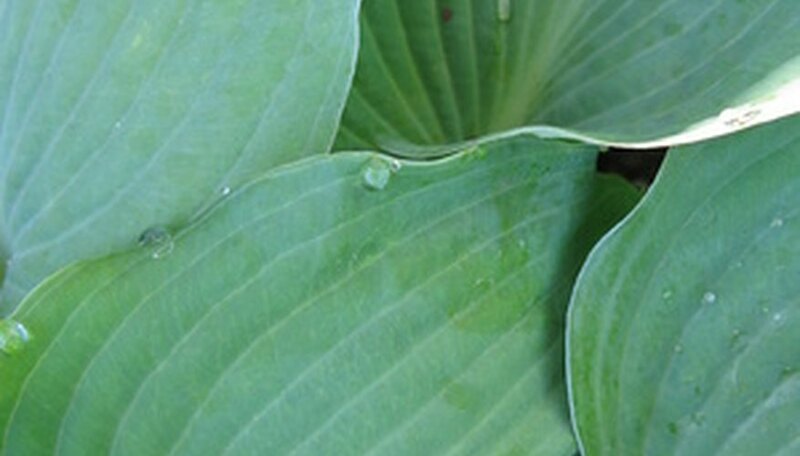 Select hosta plants to suit your landscaping need. Very large-leaved blue-green hostas enhance a wooded area or location under a tree canopy, adding a sense of depth and coolness. Hostas with strongly fragrant blooms can be placed along a path or close to an entry door, where their aroma can be enjoyed. Variegated foliage tends to appear on smaller plants than those with plain leaves. Ask your nursery about the mature size of the kind of hosta you want. Place hosta roots in a bucket of water one to two hours before planting. Keep plants damp, not soaking, if you must postpone part of the planting till the next day. Dig holes deep enough to contain the root ball without wadding, bending or pruning roots; the crown of the plant should rest at ground level. Put a handful of organic matter and a cup or two of water into each hole. Space the holes based on the mature size of the plants. They will fill in within a season or two. Keep watering until plants are established. Use hostas around your foundation for a quick, neat border. In shady areas, hostas also make a tidy finished edge on large flower beds. Plant a row of hostas at the base of your hedge; the contrast of greens is especially effective when the hedge is dark. Plant hostas to delineate space within your landscape. Taller than most ground covers but shorter than hedge plants, hostas allow you to divide yard space into areas without obstructing views. Use hostas as spatial definition around a tree, along a walkway or to divide a patio from play areas. Whether in a row or cluster, a line of hostas directs a walker where he should go in a graceful way. Control erosion on slopes or banks with hostas. Roots are tenacious and leaves can spread water beyond narrow runoff paths. Transform a bare spot into a new garden composed completely of hostas. Especially in shaded areas, hostas thrive, and the abundance of colors, textures, and blooms can create a new focal spot in your yard. Hosta still does its traditional job of filling in where nothing else will, but the new hostas make this plant much more than fill-in.